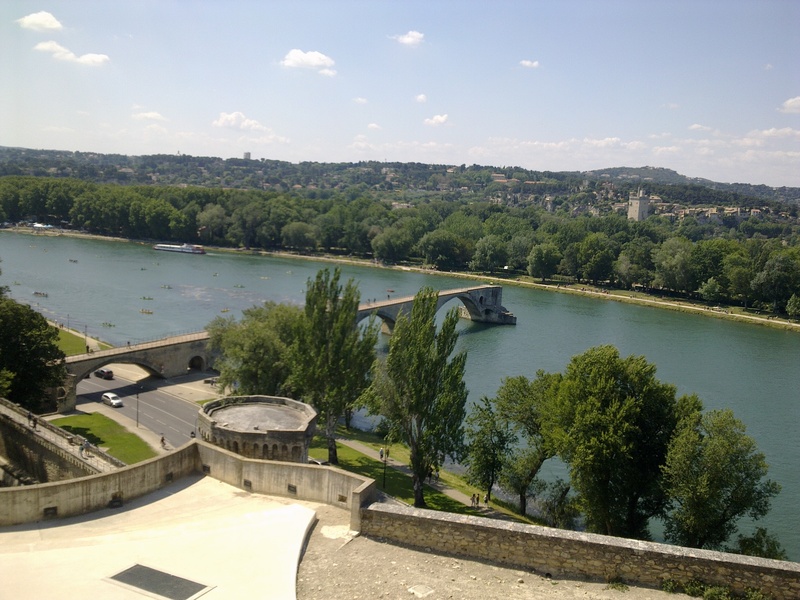 Last month I spent a few days helping a friend with his business in Avignon. This was a brilliant opportunity to canvass the views of the non-metropolitan French in respect of the current government and the state of the French economy. During my career I have worked closely with Parisian bankers and asset managers. Somewhat like London, Paris is “another country” which happens to be situated in the middle of France. In the provinces they believe in “rendre la vie plus simple”– life rendered easier. The city of Avignon is close to the tourist heartland of Provence but it is also very much a commercial centre for a wider agricultural region. The above picture is of the famous Pont Saint-Benezet bridge across the Rhone; the bridge collapsed in 1644 and is now a tourist attraction. It is better suited to dancing today than it was at the time of the 15th century childrens’ song, but, as the home of the Pope from 1309 until 1377, the city has a long history as a tourist attraction. a French engineer who works for a large utility company. None of them were overwhelmed by the performance of Francois Hollande’s PS (socialist party) government, but, to my surprise, none were surprised by his “about-turn” on economic policy. Francois Hollande was elected in 2012 on a mandate to “tax and spend” but soon achieved a volte-face. The current policy calls for Eur 50bln of spending cuts over the next three years. These cuts will be concentrated on health and welfare. Public sector wages are to be frozen – though I have no doubt many public sector workers will be promoted to higher pay grades. The headline figure is somewhat misleading since the policy package also incorporates reductions in taxes for employers amounting to some Eur 30bln. Nonetheless, it is unlikely that any other French political party could have achieved as much austerity. …The 751 members of the EU Parliament operate through coalitions of interest across countries and sometimes political standpoint. The final date for submitting a coalition is June 23, and a “coalition” has to be at least 25 members from seven different nations. Here the protest votes can play vital role. The Europe-sceptic vote is divided. The risk is that, similar to the Occupy movement in the US, all lack of common goal, except those of a negative nature, allows the majority get away with ignoring what clearly is a call from the voters to the politicians that Europe is too far away from the daily life of its 500 million citizens. …The EU “economic police” will be tested. France and Spain is already in violation of budget deficits for 2014 and 2015. The so called “recovery” is actually a stabilisation, not recovery. In history, unions, even primitive ones, fail when economic times turns negative. The condition of French government finances is not rosy: public debt to GDP is running at 57%. Tax to GDP, at 57%, is the highest in Europe. Meanwhile unemployment is stuck in double digits. The economy has stalled; Q1 GDP was zero and the IMF revised forecast for 2014 is down to 1%. Unsurprisingly, foreign investment into France declined -0.9% during the first quarter. Returning to Avignon the issues which most concerned all the “locals” I interviewed were immigration and the standard of living: or perhaps I should say “Quality of Life”. As in many developed countries, immigrants will accept lower pay and take on more menial tasks than the indigenous population. As long as there are higher paid, higher skilled employment opportunities this process frees up scare resources to be employed in productivity enhancing roles. When those opportunities do not exist a country’s standard of living suffers: younger and older workers bare the brunt. In France this effect has been softened by encouraging younger people to study longer, often at the tax payers’ expense. Older workers have been encouraged to retire earlier, again, at the tax payers’ expense. …The bottom line is that France is a society with the same level of technology and productivity as the US, but one that has made different choices about retirement and leisure. Vive la difference! What should we expect from these “bad” supply-side policies? I’d say we should expect less work effort at almost every single margin. Earlier retirements, more students staying longer in college, longer vacations, and a higher unemployment rate. France has always had a reputation for employment protection but overall it is not dramatically different from its larger European neighbour as the OECD – Employment Outlook 2013 reveals in their latest employment protection rankings. Whilst France is above the OECD average (Page 78 – Figure 2.1) it is not that far above Germany. TheInternational Labour Office –An anatomy of the French labour market – January 2013gives a detailed account employment trends. The rise of temporary labour has been as prevalent in France as in many other countries despite, or perhaps as a result of, its rigid employment laws. The ILO describes this as a Two-tier system which creates a more stringent protective framework for workers on long-term contracts and very limited protection for workers on short-term contracts. According to their report the legislative policies in countries such as France and Spain has led to higher job turnover. Since the 1990’s France has seen a 70% to 90% increase in short-term employment. This trend has accelerated since the Great Recession. The share of temporary jobs in the private sector is far higher among young workers aged between 15 and 24 years old than among prime-age workers (25-50) and senior workers (over 50): 39.9 per cent vs. 10.7 per cent and 7.0 per cent in 2010. It is also higher for women (15.2 per cent) than for men (9.1 per cent). Wage premium for permanent contracts for 15 European countries. But what does all this mean for the French financial markets? To judge by the recent performance of the CAC40 and 10yr OATs, not much. 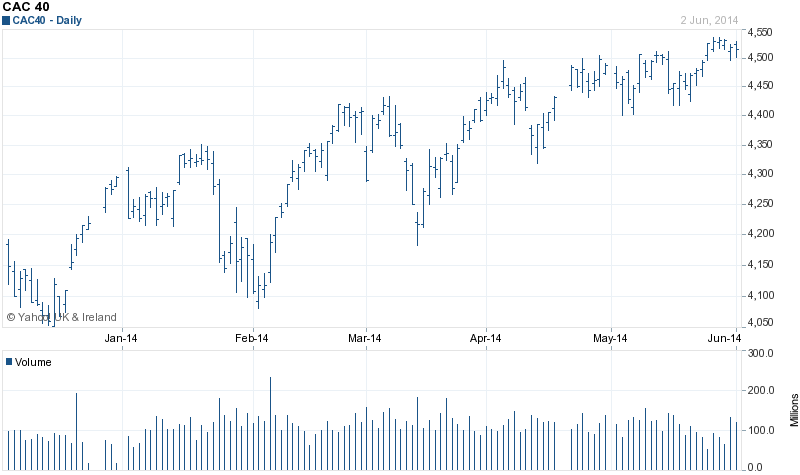 The new highs have been achieved on low volume which may indicate a lack of conviction. What is clear is that the EU election results were anticipated. What is less clear is whether the market reaction is a sign of approval at the “protest” or apathy. It is clear that the financial markets are more concerned about ECB policy. May 2014 EU inflation was +0.5% vs an ECB target of +2%. The small cut in the refinance rate this week and the introduction of negative interest rates on deposits held at the ECB are hardly sufficient to offset the disinflationary forces of the EZ rebalancing which has been on-going since the great recession. The end of “monetary sterilisation” and new targeted LTROs, together with the proposal for the ECB to purchase certain ABS, however, looks like the beginning of something more substantial. OMT is still in the arsenal but has yet to be deployed. The all-time low yield was set in April 2013 at 1.64% but, with French growth apparently slowing, yields remain wedded to those of German Bunds. 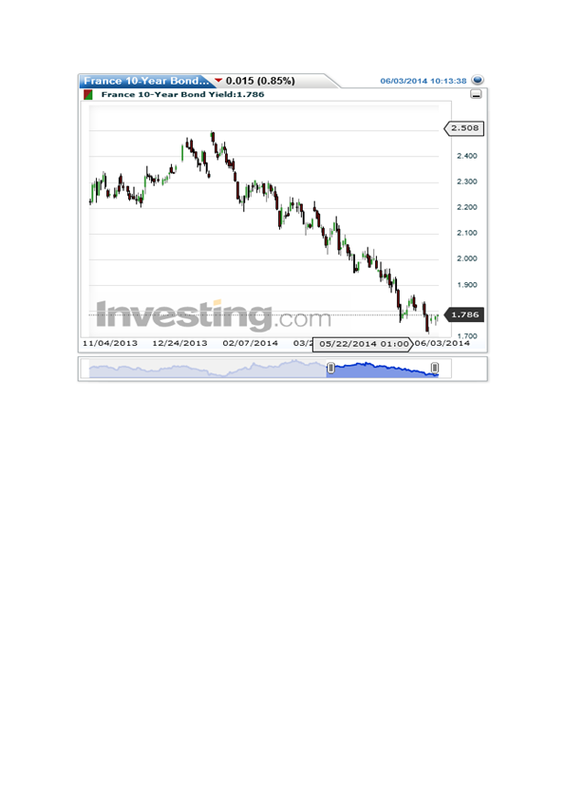 The 10 year spread has continued to converge this year from 65bp on 15th January to around 40 bp today. In their March 2014 Global House Price Index report, Frank Knight commented that residential property in France and Spain was still languishing. 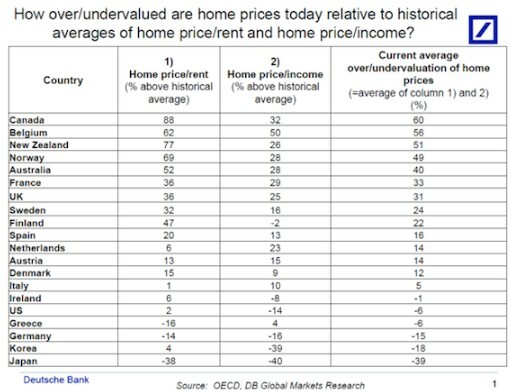 However, in comparison with March 2012 prices were down only 1.4% in France compared to 4% in Spain and 9.3% in Greece. If historically low interest rates cannot stimulate demand for Real-Estate then asset managers would do well to allocate to a more attractive asset class. With OAT yields nearing historic lows the CAC40 appears to be benefitting by default; it trades on a P/E of 26 times. The UK, with the strongest growth forecast in Europe, is trading at 33 times (FTSE) whilst the DAX trades on a P/E of 22. The French Revolt at the EU elections is principally a protest against the immigration policies of the French administration. The main concern of the average French voter is long-term employment and quality of life. The policies of Brussels, which reinforce those of the French administration, are seen as contrary to the interests of the French people in respect of immigration but this does not mean that the French people are anti-EU. French financial markets have paid little heed to the EU election results. The actions of the ECB are of much greater importance in the near-term. The longer-term implications of the gains for the Front National will be tested at the Senate Elections in September this year, but, given the large socialist majority last time, any swing to the Front National will be a further “protest”. The real test will be at the presidential elections – scheduled for 2017. Low interest rates from the ECB look set to continue. The central bank has now begun to utilise some of the unconventional tools at their disposal to transmit longer-term liquidity to the non-financial economy. OAT yields should remain low in expectation of the implementation of these more aggressive policies. They will also be supported internally if Hollande succeeds with his austerity package. French property prices are likely to remain subdued and may weaken further if the economy continues to stall. French stocks will therefore continue to benefit, both from international and domestic capital flows, but, at their current valuations, they will reflect the direction of international markets led by the US and, within Europe, by the UK and Germany.